Award-winning Joyful Noiseletter Editor Cal Samra, a health and humor historian at age 87, takes you on an adventure to meet a host of health pioneers down through the centuries. They include religious leaders of all faith traditions, medical doctors, scientists, dieticians, nutritionists, body builders, professional athletes, agnostic philosophers, comedians, conservatives and liberals. You'll be amazed at how much they agree on what it takes to live a healthier and longer life – advice which has long since been forgotten or ignored. The adventure starts with Hebrew prophet Daniel (circa 620 BC) and proceeds down through the centuries to Jesus and the Apostles, the third-century Greek physicians, the Franciscans, John Wesley, Harriet Beecher Stowe, Ellen White, Sojourner Truth, Dr. John Harvey Kellogg, the Hindu Swami Vivekanada, Theodore Roosevelt, George Bernard Shaw, Catherine Doherty, Linus Pauling, Jack LaLanne, Patch Adams, M.D., Mehmet Oz, M.D., professional athletes like Tom Brady and Serena and Venus Williams, long-lived comedians like Bob Hope, and many others. The book, which one health pioneer wrote "reads like a documentary," is fully indexed and designed to be a resource book for health professionals, pastors, and anyone wishing to live a healthier and longer life. The author pleads with pastors: "While you're teaching people how to get to Heaven, how about teaching them healthy lifestyles to survive on this earth?" Perhaps it is time that seminaries, divinity schools, and churches introduce health and longevity classes, including good nutrition, physical fitness, and even yoga. Possibly that may be the key to a true revival. To extend their careers, many enlightened professional athletes are now following the dietary and training advice recommended in this book by Tom Brady, the New England Patriots' quarterback and five-time Super Bowl champion who is still going strong at age 41. 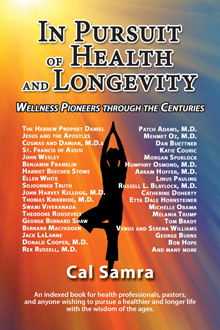 Brady recommends a diet of 80% fresh vegetables and fruits, very similar to the diet recommended by wellness pioneers for centuries (see Cal Samra's book above). Dr. Patch Adams, "the clown-prince of physicians," who still makes house calls, offers some wise and wacky advice for anyone to visit hospital patients and out-patients and bring healing love, humor, compassion, friendship, faith, and hope to speed recovery. Patch aims to humanize hi-tech medicine. Merrily illustrated with cartoons by Jerry Van Amerongen. The creator of the award-winning "Speed Bump" cartoons offers a book of hilarious cartoons skewering health professionals and spoofing the quirks of patients. It's the perfect gift to help a hospital patient, outpatient, or health professional feel better. Just what the doctor ordered. Kids provide endless material for laughter -- and this unique collection of humor, drawn from the files of past Issues of The Joyful Noiseletter, will tickle your funnybone. Scores of jokes and humorous stories, all relating to the hilarious things kids say and do in and out of church, are categorized into chapters and accompanied by the cartoons of talented Christian artists like Bil Keane of The Family Circus. Assembled by the editors of The Joyful Noiseletter. Read it in Sunday School or with your kids, or give it as a gift to other parents or grandparents. They'll love it. A discouraged and despairing Protestant chaplain tells how he turned around his ministry and delivered a joyful, cheerful spirit with lots of humor to patients and staff at a North Carolina hospital for 14 years. "Chaplain Jack" has written an amazing story about the close cooperation between a joyful, witty chaplain and the medical doctors and nurses at the hospital. "After 14 years of dosing out daily spoonfuls of healing humor to patients, loved ones, and members of the hospital staff, I'm convinced that laughter is still the best medicine," Hinson writes. "Good humor is our ally in the healing process." Joe Garagiola's new book, Just Play Ball, is probably the funniest book ever written about baseball. Starting with a forward by Joe's lifelong friend Yogi Berra, the book serves up hilarious anecdotes, stories, and one-liners from Joe's many years as a Major League catcher and Hall of Fame sportscaster. The book is a fresh look at what's right with Major League baseball. Joe's keen sense of humor resonates with both young and old; it's a humor that springs from the love of the game and the players. "I wrote the book," Joe said, "because I got tired of reading about steroids, human growth hormones, drugs, and the rest. To paraphrase Will Rogers, I've never seen a game I didn't like." There are 24.7 million tennis players in the United States. If you are one of them, you are likely to see yourself and your tennis friends in this hilarious book of tennis cartoons, anecdotes, and witty quotes. If you're not one of them, this book is the perfect gift to cheer up a tennis player who needs some laughs. Cal Samra, editor of The Joyful Noiseletter and a tennis enthusiast, put together this book, which features the tennis cartoons of 11 cartoonists, including Bil Keane, creator of The Family Circus, and Charles M. Schulz, creator of Peanuts. Many of the cartoonists contribute regularly to JN. But that's not all. This book is also about the health benefits of tennis played with good humor. "Laughter is good medicine," says Dr. Ellen Rome, a Cleveland Clinic physician who is a tennis player herself, "and if tennis is played for fun and with good humor, the health benefits are even greater." Here's more proof that vigorous exercise and humor are powerful weapons in the never-ending battle against obesity and depression. You'll read about the longevity of many tennis players, humorists, and comedians. And you'll be inspired by stories of tennis aficionados who play competitive amateur tennis into their 80's and 90's. And you'll be introduced to Samra's Law: The older tennis players get, the funnier they get. "Cal Samra has collected a treasury of cartoons, anecdotes, and witty quotes that will bring a chuckle from even the non-tennis player. The book is an easy, feel-good read that definitely captures the funny side of tennis." "A former AP reporter and editor of an award-winning humor newsletter, Samra takes a look at the lighter side of tennis with the works of 11 different cartoonists, and interweaves anecdotes and quotes that will leave you chuckling." The contributors to Holy Humor and More Holy Humor have been called "the world's funniest Christians." These two rib-tickling treasuries of Christian joy and humor  from the first 10 years of The Joyful Noiseletter  together have sold more than a half-million copies. Each book features about 100 cartoons by 16 gifted cartoonists, including Bil Keane, creator of The Family Circus, and Johnny Hart, creator of B.C., and an avalanche of healing humor, knee-slapping jokes, clean limericks, bulletin bloopers, and "jestimonials." Conveniently arranged by topic or month for easy use, both books are also fully indexed. A collection of favorite jokes, inspirational humor, and cartoons from The Joyful Noiseletter. Here is the hilarious sequel to the best-selling books, Holy Humor and More Holy Humor, effectively disproving any notion that Christians are relentlessly dour, melancholy, humorless, and joyless. This book is packed with more side-splitting clean jokes, uplifting stories, one-liners, bulletin bloopers, out-of-the-mouths-of-God's-kids, joyful Scriptural references, and priceless cartoons. The book is fully indexed for quick reference for pastors, public speakers, teachers, and health professionals. Here’s a great stocking-stuffer – a 5 x 5 gift book featuring a collection of millennium humor and cartoons. The best over-the-counter remedy for the blues or burnout. All of these books can be ordered using our online store by clicking the Add buttons. Jesus asked us to “be of good cheer.” For 33 years we have offered books and prints which focus on the joy, humor, celebration, and healing power in our Christian faith. Humor, like love, crosses denominational lines. We strive to offer humor which is tasteful and rooted reverently in the Christian faith.